Despite the daily updates, the major distinction of Theresa May’s Brexit negotiations is that there has been precisely no change since December 2017. The agreement made then to go to transition and to accept the Irish border backstop was the last real progress, and even that has been largely clawed back by May in the nine months since. Caught between the EU’s unwillingness to compromise the single market and the DUP’s refusal to accept a border in the Irish Sea, May is left without much room for manoeuvre – hence the car crash of Chequers and Salzburg. The real momentum in the Brexit debate this year has been the dramatic shifts in public opinion and the Labour movement. As recently as March, any discussion of a people’s vote was seen as outlandish. Six months on, a people’s vote is an increasingly credible and likely outcome. Leading national figures from across the political spectrum, business and civil society have pledged their support, while public opinion has seen a long term shift in favour of a public vote. The second major shift has been in the Labour movement and on the left. 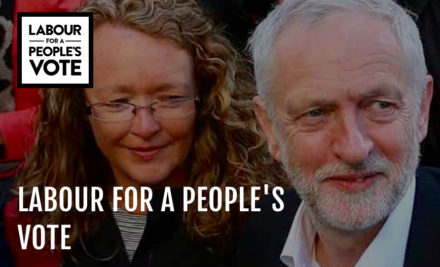 Over 130 CLPs submitted contemporary motions to conference, the majority from the left of the party, calling for a people’s vote on the Brexit deal, with or without a general election, and the election of a radical Labour government. This represented the most motions submitted to conference on a single issue in history – clear evidence of the strength of feeling among Labour members and the grassroots. The dramatic shift by major unions including GMB, and the TUC itself, to back the principle of a popular vote on the deal if it fails to cater for the needs of working people has bolstered members’ views. Meanwhile an increasing number of MPs, councillors and leading left-wing figures have come out in support. Opposing a Tory Brexit and supporting the election of a radical government is now the majority view. Given Labour’s renewed focus on party democracy, this must herald a change in party policy to support a people’s vote and defeat Tory Brexit. Campaigners for a people’s vote have debunked the argument that supporting it would harm Labour’s chances of winning a general election. Labour could gain four million votes – enough to put us in power – if we backed a people’s vote. Peter Kellner of YouGov said this week that “by backing a popular vote on Brexit, the party would end up making significant gains in votes and seats. In a tight general election, it could make the difference between returning to government and remaining in opposition”. Labour MPs worried about their seats need to know that Labour Leave voters are the group most likely to have rejected Brexit. By supporting a new vote, Labour could gain millions of voters and, thanks to the shift from Leave to Remain, we only risk losing 200,000. Labour’s electoral prospects run through a vote on the deal – not in opposition to it. This is the political reality as Labour enters conference: a movement increasingly united against Tory Brexit and behind a people’s vote; the left of the party leading the campaign, with the support of most trade unions and the TUC; existing and potential Labour voters united in their desire for a people’s vote and against a Tory Brexit they recognise would lead to chaos in trade and security, lost jobs, cut wages, damage to the NHS and reduced workers’ rights. Added to the economic and security impacts, the dog whistle approach of Boris Johnson and others has highlighted how the project to leave the EU has been hijacked by the anti-immigration, anti-multicultural far right, with all the implications this has for community cohesion, migrants, minorities and hate crime. This further alienates Labour voters and could draw more swing voters into Labour’s camp. If any other Tory policy threatened so much that we in the Labour movement have worked for over decades we would oppose it wholeheartedly. Brexit should be no different. The Tories are trying to hijack a vote that was about being in or out of the EU to further their low tax, low regulation, low standards Thatcherite vision. It’s up to the Labour Party, the unions and the wide labour movement to strongly oppose a Tory Brexit, explain clearly the implications to the public and present a vision of a better future. One reached under a radical Labour government playing a full part in the reform of the EU and the continent-wide fight against the far right and the demonisation of migrants. The next week is crucial for the country and for the Labour Party. Supporting a People’s Vote and opposing a Tory Brexit is the best, in many ways the only, way to present ourselves as a government in waiting, ready and able to move the country on from the chaos that the Tories have pushed us through over the past three years. In opposing Brexit we can articulate our radical vision for a unified country at ease with itself, more equal, more secure, better integrated and better led, working in partnership with our European allies against the far right extremism of Orban and others that the Tories do more and more to support and emulate. With a record number of CLP motions calling for a commitment to support a people’s vote, the support of the mainstream left of the party and the major unions, it’s now up to conference delegates, trade unions and the leadership to decide the way forward. Given the implications for the country, and for our ability to win a general election – with all the promise that would bring of a radical Labour government – the stakes could not be higher. Mike Buckley is director of Labour for a People’s Vote. Mike Buckley is director of Labour for a Public Vote.